All breed Deaf Dog Training Camp! Our Deaf Dog Training Camp combines obedience through sign language, confidence building exercises, physical conditioning, and off-site training to properly train your deaf dog. This eight week course will establish communication and proper etiquette custom tailored to meet your specific needs. Instead of boarding your dog at a kennel, let him/her stay with our expert trainer. While you are away, your deaf dog will learn obedience training, hand signals, strength training, confidence building, and a variety of field trips. You will come home to a new and balanced companion. 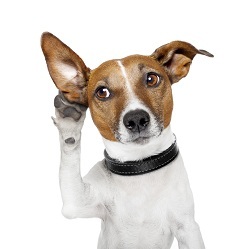 We speak ‘Dog’ and will help bridge the communication gap between you and your deaf dog. Heel – Your deaf dog will walk by your side without pulling and will automatically sit when you stop. Down and Stay- Your deaf dog will lay down on command and hold that position until released. Sit and Stay- Your deaf dog will sit on command and will stay until released. Come/ Recall- Your deaf dog will return to you on command and sit. Treadmill Trained- Your deaf dog will be trained to run on a treadmill so you can exercise him/ her during the cold months in the comfort of your home. Upon completion of this program your deaf dog will receive a certificate of completion from Empire K-9. The key to having a well-mannered deaf dog is to start training early on. This hearing impaired dog training course is specifically designed to help create communication between you and your dog. 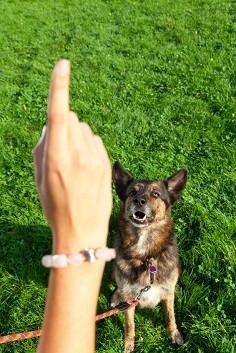 Teaching your dog hand signals and how to focus on you the handler, is the key to success. 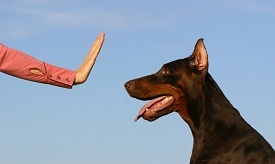 This program incorporates basic obedience imprinting and etiquette training. Our goal is to make sure that your deaf dog is groomed to be a balanced member of your family. In addition to your deaf dog’s needs, we recognize that as a new owner, you may also have questions and concerns. Part of our program is dedicated to educating and working with owners to ensure the needs of the entire family unit are met.